Canadian Registration Numbers (CRNs) are issued by regulators before pressure equipment is sold or used in Canada. Though there are exceptions, CRN registration is generally needed for pressure equipment that contains expansible fluids at pressures greater than 15 psig. Expansible fluids include vapors, gases, and fluids that expand to a gas or vapor when exposed to atmospheric pressure or temperature. 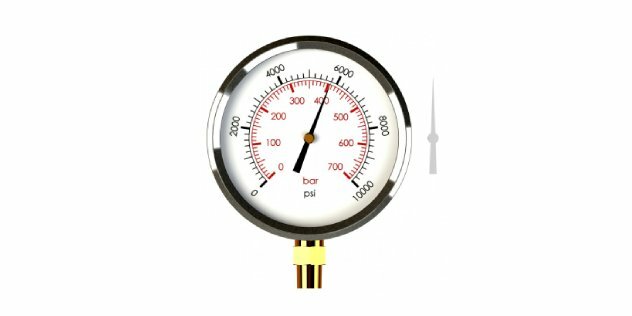 Pressure is of utmost importance when designing wall thicknesses of pressure equipment (vessels, heat exchangers, boilers, fittings, appurtenances, pressure piping systems, thermal liquid heating systems, and so on). Obviously, thicker walls will withstand more pressure than thinner walls. When it comes to what pressure is, the meaning of different terms is important, otherwise misunderstandings can occur and public risk can increase. Regulators certainly do not necessarily equate MAWP with design pressure, and for good reason. For starters, the MAWP of pressure equipment is never greater than design pressure (in the absence of a separated internal chamber), even though there are those in industry that would argue otherwise. Designs showing an MAWP greater than design pressure do not warrant CRN registration since they contradict code requirements, and they indicate a misunderstanding of the difference between the two. I’ve included a diagram to illustrate the point with an example. Dark blue is MAWP. Dark blue + light blue = design pressure. 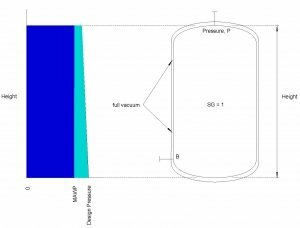 In this instance, design pressure includes the addition of a vacuum jacket and static pressure, like what you might see with a cryogenic vessel containing liquid nitrogen or oxygen. As you can see, MAWP is never more than design pressure (in the absence of a separated internal chamber). Just a few more points to make…Some software these days will take the design pressure input and then, with assistance of some iterative techniques, suggest a maximized pressure which is greater than the design requirements and call it MAWP. This is contrary to code requirements, promotes the wrong idea of what MAWP is and leads to incorrect understanding. But software is never supposed to be wrong! Well, think again, since design pressure is never less than MAWP. Also, process facility piping designs might well use terms similar to design pressure or MAWP to describe the maximum process pressure. Sometimes, this pressure might be transcribed onto the mechanical equipment list or specification sheet by mistake! But beware, maximum process pressure, MAWP, and vessel design pressure are certainly not always the same, and cannot necessarily be interchanged. And, for small fittings not subject to significant static head or vacuum, the MAWP is in some cases the same as design pressure and, for such fittings, MAWP and design pressure are thereby often used interchangeably on fitting drawings. MAWP and design pressure are significantly different.